There comes a time every semester here when some students will walk around campus holding specific plants, and whenever that time has come in the past, I have been extremely jealous. “Why does she have a plant? I have to figure out which class this is,” I’d think to myself. I tried to think of other ways to get a plant. I took a plant biology class the next semester, but I never got a free plant. It didn’t occur to me that I could just do the assignment I heard about on my own for months. It happened to me in September. It was Plant Day again, and I finally decided to go up to somebody and ask what class the plant he was carrying around was for. He said ecology. I had already taken both science classes I needed for my degree, and I was not exactly keen on taking one as an elective, especially since I’m double-majoring, so yeah, I kind of can’t waste my credits. 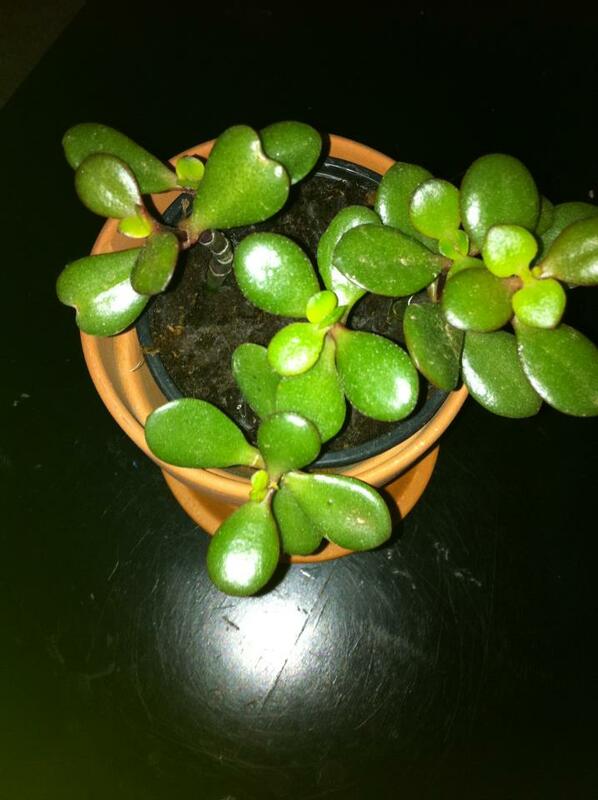 I decided then and there to get my own plant. A few days later, I walked out of the local Wal-Mart with my plant, which I had placed into a pot that was a little wider than the plastic one he came in (the pot is more for decoration.) I named it Norman. I would have bought a pack of seeds, but autumn was approaching and I didn’t want to kill anything. 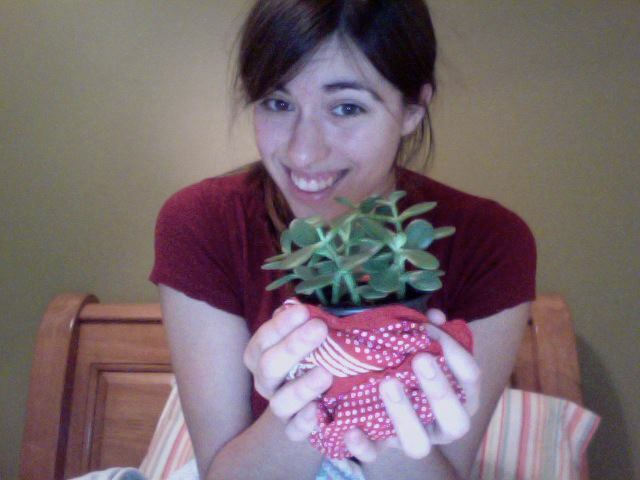 Plus this is one adorable plant. I sat him outside in the warm air, and marveled at the realm of botanical responsibility I had entered. Norman’s growth was pretty, well, nonexistent for a few months. I didn’t think he would get any bigger at all, actually. After the semester ended, I brought Norman home to Macon with me for Christmas break. It worked out really well because Norman fits in my car’s cup holder perfectly. We drove towards home and the holidays excitedly. I figured he’d die of loneliness at my dad’s house, so I took him to my mom’s. She was really excited to meet him – she was one of the first people I told about him, actually. My mother took excellent care of Norman. It was during one of my last days on break that she pointed out how well he was doing at her house – Norman had grown an extra leaf. My mom wanted to keep Norman, because he was obviously happier in Macon with her than he was in Athens with me. But no, I was selfish. I brought him back to Athens, where he resumed his old life: stable, yet complacent. Little did I know that my decision to bring Norman back to school with me would almost kill him. Two months later, spring break arrived. I decided to leave Norman in Athens for the duration of my absence. He really doesn’t require that much water, and I assumed my roommate would water him if he got too dry. When I returned to Athens, Norman’s soil was dry and flaky. It even looked like some had disappeared – I have no logical explanation on how that happened. My other ideas don’t make that much sense. The first thing I did when I saw Norman in such a frail condition was stick him under the faucet. There wasn’t enough dirt in his pot to support his drooping stalks, so I went outside and put some soil from a dead plant’s pot and put it in his. Norman needed support: his stalks were hanging over, and some of his leaves fell off when i touched them. That terrified me. For days I paid a ridiculous amount of attention to my plant. I gave him too much water at first – so much that the top layer of his soil looked like it was covered in either mold or rhizomes, I’m still not sure. Then I decided to make sure he got as much sunlight as he could so the excess water would get dried up. That worked a little. Then I decided that maybe by having a companion, Norman could return to his health. I bought a pink hydrangea and named it Happy, and sat her next to Norman on the table on my porch. Happy was different from Norman – she required lots of water and actually produces flowers. Despite their differences, Norman and Happy have a beautiful friendship. They always sit next to one another and I water them at the same time. I think Happy’s presence actually improved Norman’s health, because he has started growing again. Now my baby Norman has six new leaves and a wonderful pink friend. And best of all, I didn’t kill my plant.